As a dog gets older, the wear and tear on their joints will begin to show. Dogs have a natural tendency to hide illness and pain, but as they get older, you may be able to see signs of joint pain. Is your dog limping? Having trouble going up stairs, sofa, or doesn’t want to go on walks as much? If you put your hand on their back, do they react? We have scoured through numerous medical and veterinary journals to find all natural herbs with proven effectiveness against arthritis and joint pain. Our herbs have been chosen to naturally stop joint inflammation, rebuild lost cartilage, reduce pain, and cleanse your dog’s system of toxins and compounds that are the root cause of the ailment. Commercial dog foods are designed to meet only the minimum requirements for your dog. If you feed your dog commercial dog foods, your dog will benefit from our fresh herbs and added nutrients that are in our supplements. If you make fresh food for your dog, our supplements will help you feel confident that your dog is getting all the necessary vitamins and minerals that he or she needs to stay healthy. Today’s dog is exposed to many pollutants in the air and water. Even taking your dog for a walk will expose them to car fumes in cities and pesticides in the country. Even in an area that is free of pollutants, pollen and other allergens can cause problems in dogs with weakened immune systems. 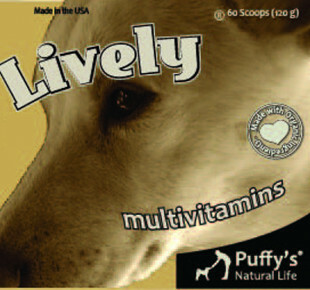 Our supplements use all natural foods that are proven to protect your dog’s liver, and increase their immune system. Farm produce without special labels are grown or raised with the use of pesticides in almost all cases. Pesticides are known to cause cancer.1 In fact, there is a study that shows that dogs who lived with owners who applied a common pesticide to their lawn had a two-fold increase in the chance of getting malignant lymphoma.2 Pesticides have been shown to contaminate the food that we eat. If pesticides are showing up in human foods like fruit juices for children, we are concerned with what pet food companies are feeding dogs. This is one reason why we use organic ingredients. Organic foods are grown without or with the minimum use of pesticides. Furthermore, Organic foods can not be genetically modified or cleaned using irradiation or industrial solvents, and can not use chemical food additives. All of our Organic ingredients have been certified by the USDA. There are a number of factors that influence the nutritional value of foods, but on average, organic foods have been shown to contain higher quality protein with more vitamins and minerals, and more antioxidants. 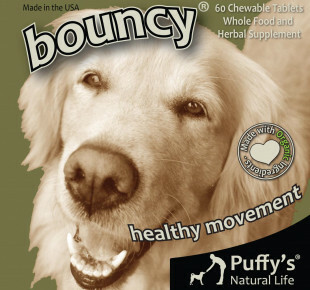 We believe that using organic foods are higher quality and more nutritious- and will help your dog become more healthy. With our supplements you can ensure that your dog gets at least part of their meal is organic! Most supplements have vitamins that are synthesized in a lab. It’s this method that allows a more concentrated pill in a cheaper way. However, in order to synthesize or extract these vitamins, a chemist has to use many solvents that are unnatural and often hazardous. For example, a common starting point for the synthesis of Vitamin A is Acetone, the active ingredient in nail polish remover. The synthesis process then uses a variety of solvents like lithium and ammonia. Why not avoid these chemicals and give your dog Vitamin A from a natural source? Furthermore, a concentrated amount of a single chemical, even one that isn’t toxic will put a great strain on your dogs liver and kidneys. A sudden influx of purified chemicals has to be processed by your dogs digestive system, through its kidneys and liver. Vitamins that have been obtained from whole foods are processed through natural digestive methods, which puts much less strain on your dogs’ organs. Also, research has shown that vitamins that come from natural sources are absorbed more readily into the body. Vitamins in nature are never isolated; they exist in complexes within your food. This means that whole foods contain vitamins in ways that are different from synthetic vitamin pills. As a result, humans and dogs absorb vitamins from whole foods better than from synthesized or purified vitamins. Regulations for what is acceptable for food varies drastically for pets from what is acceptable for humans. For example, in pet foods that are not labeled as “Human grade”, the meat is from left over pieces of the animal. Even meat from animals that are already dead or from diseased animals can be put used for your pet’s food. With our supplements, you can be assured that we use only the best ingredients – ingredients that we would love to eat ourselves!